With the various materials below, if you wish to see larger versions in more detail, please just click on the image, which will enlarge it. 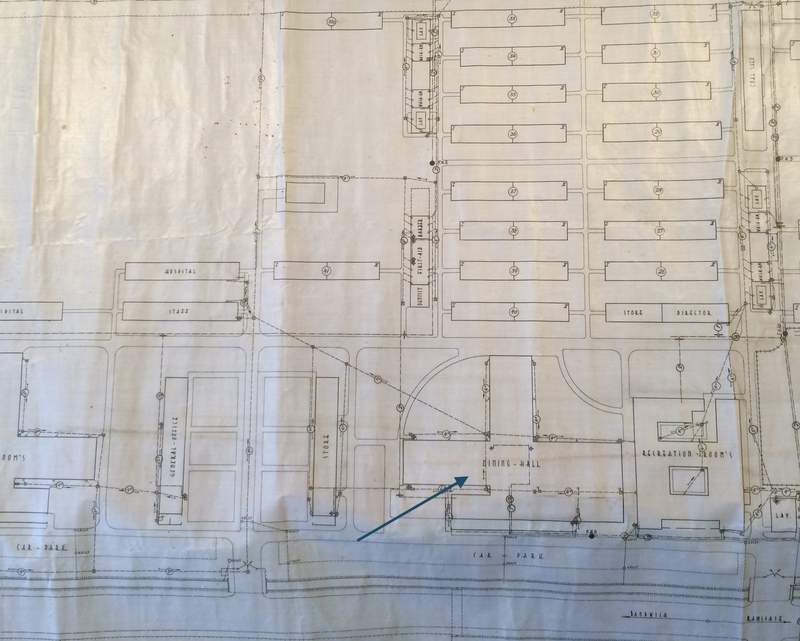 The documents and accounts are starting to come in now and, using these, we are beginning to build a picture of the physical layout of the camp (see below), details about the buildings, routines, food, and so on. 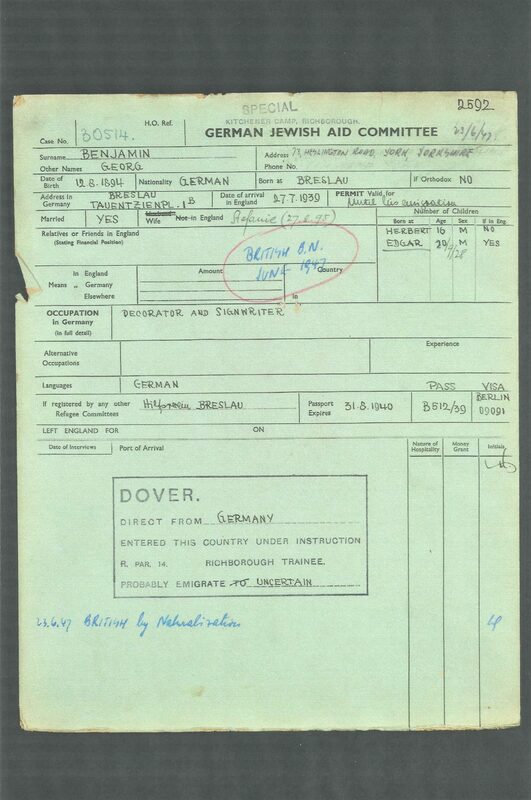 As you will have gathered, most official records from Kitchener were destroyed during the war – mostly to protect the men – and especially those with families still in the Reich areas. This is the nature of the problem we begin with, and an important part of why we started this project to collect records at the level of the family. By collating a lot of individual information, we hope to get a fuller picture at the broader ‘historical’ level. In what follows, we have provided the details gleaned to date: we expect this page to be much larger and much more specific before we have finished. One of the historically significant items that is starting to emerge from this project is the age range of the men in the camp. Nominally, there was an age range of 17 to 40; some stated it was 17 to 45. We now have a little under 750 names with many dates birth on our List of Names (dated as of 08 February 2018). And a quick scan suggests there were men in their late 40s here, and so far one 50 year old. At the other end of the age scale, the youngest we have found to date was sixteen. It will be fascinating to see how this pans out as further information comes in. 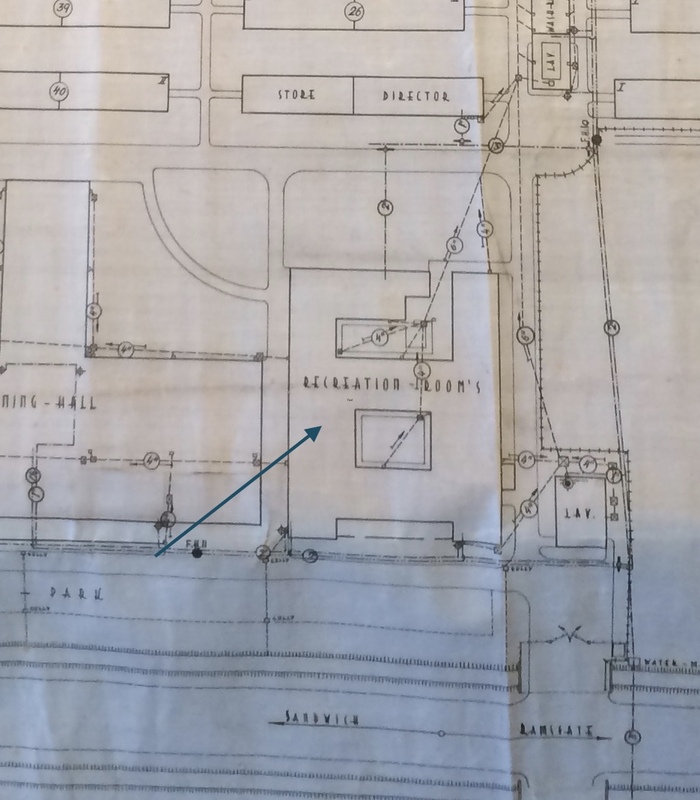 Context: how did my father / grandfather gain a place at Kitchener? By the late 1930s, the Reichsvertretung der Juden in Deutschland had long been trying to organise a place of escape to which they could direct people: they were inundated with requests for help to leave. After November 1938, when tens of thousands of Jewish men had been rounded up across Germany, Austria, and ‘the Sudentenland,’ and imprisoned (mainly) in Buchenwald, Dachau, and Sachsenhausen, they were eventually released on condition that they left Germany. Until they had somewhere to go, they had to report to a police station every week, and they meanwhile remained at risk of re-imprisonment, which would have meant almost certain death. Hundreds had died in the camps because conditions were so bad and their treatment so brutal. Thus, the priority was to get these sons and husbands out of the country at all costs. Most will have assumed that at some point they would have been able to gain employment somewhere and then bring their families out of Germany to join them. 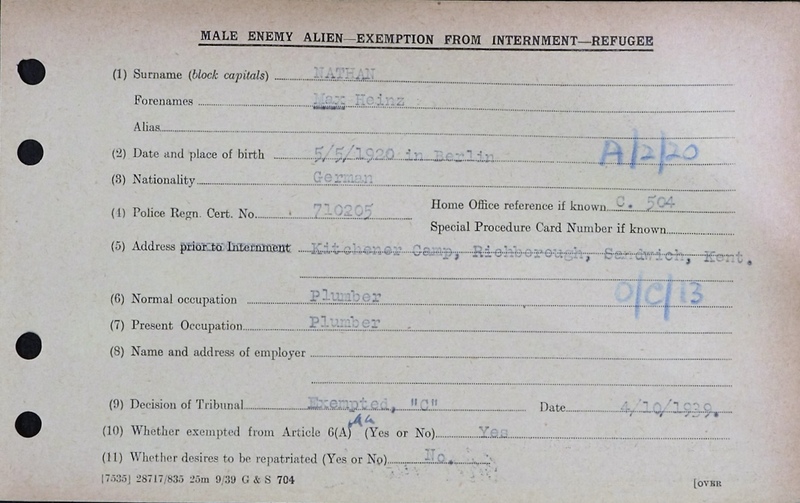 Kitchener Camp never offered this opportunity, it should be noted, as the refugees were only allowed temporary residence visas and were required to ‘transit’ on elsewhere. 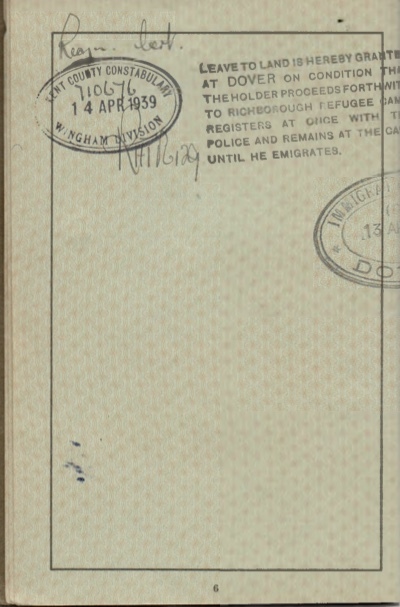 To obtain a place at Kitchener, then, the men had to show that they had a good chance of being able to move to another country – which meant being able to prove they could find work. 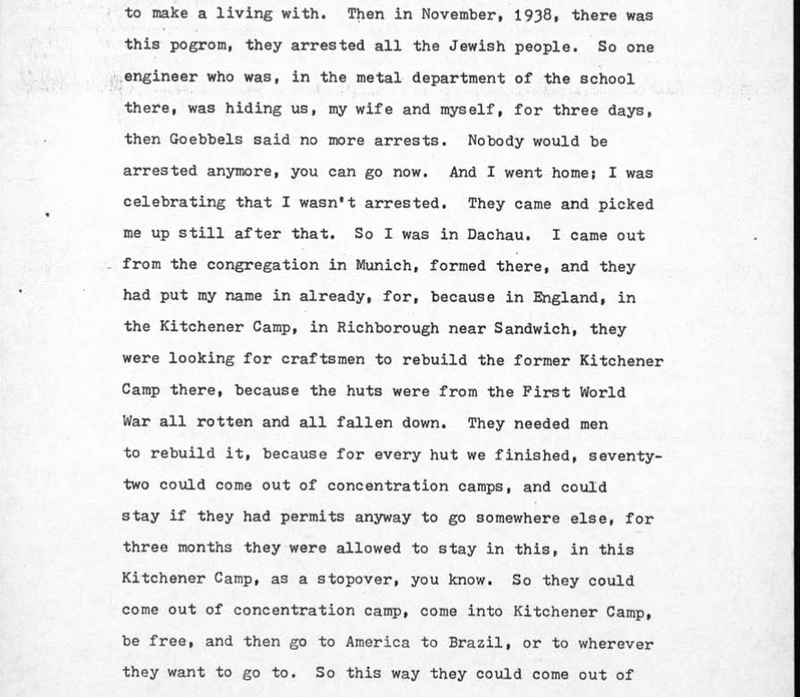 The journal of the Association of Jewish Refugees carries a number of articles on Kitchener, one of which includes witness testimony from Werner Rosenstock, editor of AJR Information from 1946 to 1982. 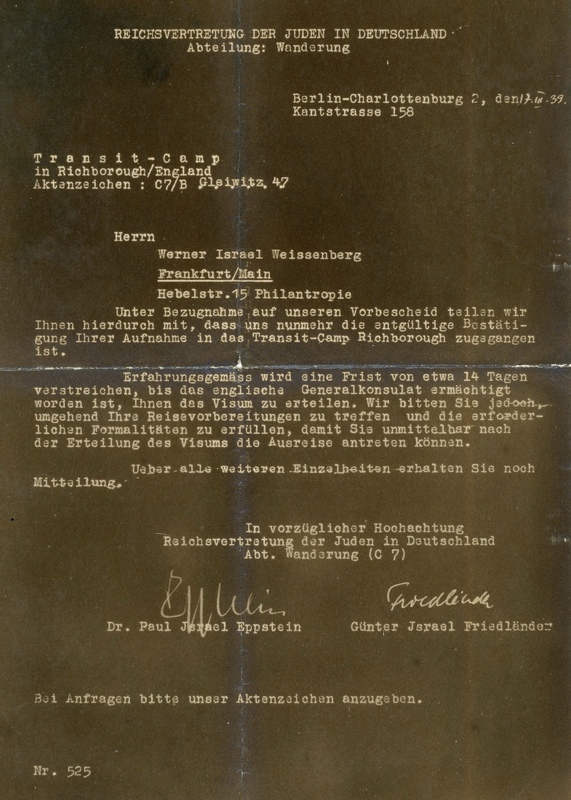 In 1939, Rosenstock had been “employed at the Reichsvertretung der Juden in Deutschland, the only major Jewish organisation still functioning in Germany after the November pogrom. He worked in the department responsible for selecting those men from the camps whose applications for transit visas would be successful, and thus he had considerable first-hand experience of the scheme” (Anthony Grenville, AJR May 2009). "He worked for a committee that chose as many emigrants as possible, provided they were under 45 and had some kind of documentation promising entry to a foreign country, from the mass of shorn-headed applicants freshly released from Nazi camps and from those still imprisoned, whose cases were pressed by their relatives. The agonising decisions the committee had to make were all too often a matter of life or death" (AJR May 2009). 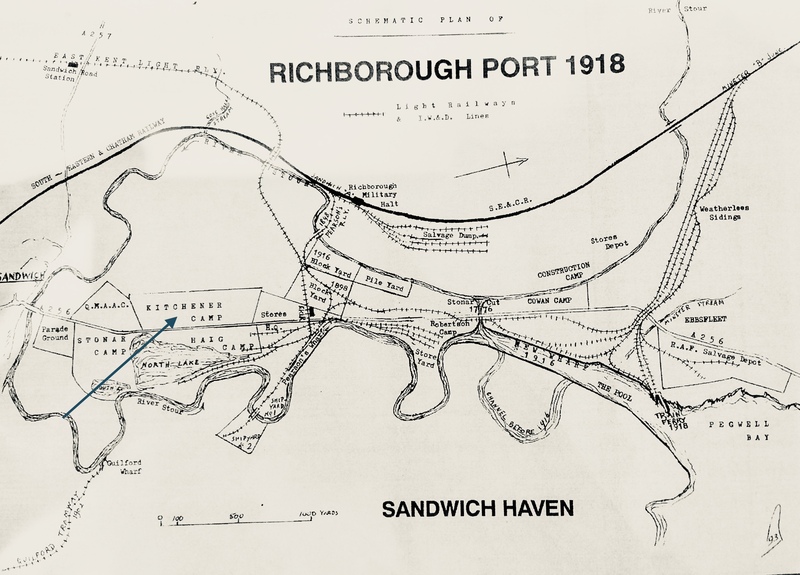 So far, we have come across few descendants who know why their relative was chosen to be saved in this way and given a place at Kitchener Camp – without which they would almost certainly have died with the rest of their family. 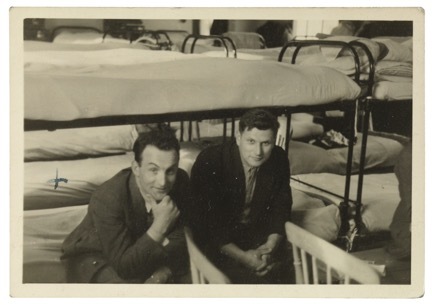 Some, clearly, were brought in for their ability to help rebuild the camp and keep it functioning, and because their practical skills meant they had a good chance of being able to show they would be able to find work elsewhere and emigrate onwards. Bear in mind, to house around 4,000 people here – to take it from a derelict site to habitable, in about a month – was an extraordinary undertaking. 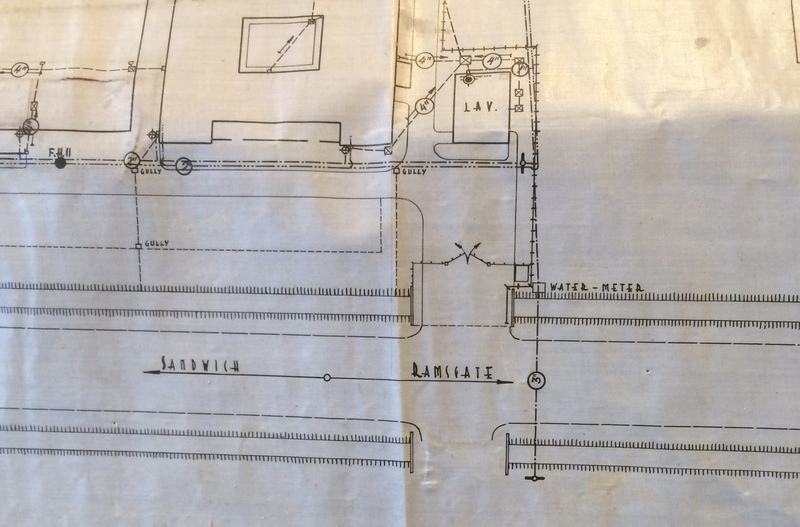 Take a look at this fraction of the necessary infrastructure in the plan extract below, and you will gain some sense of what these early arrivals had to achieve. 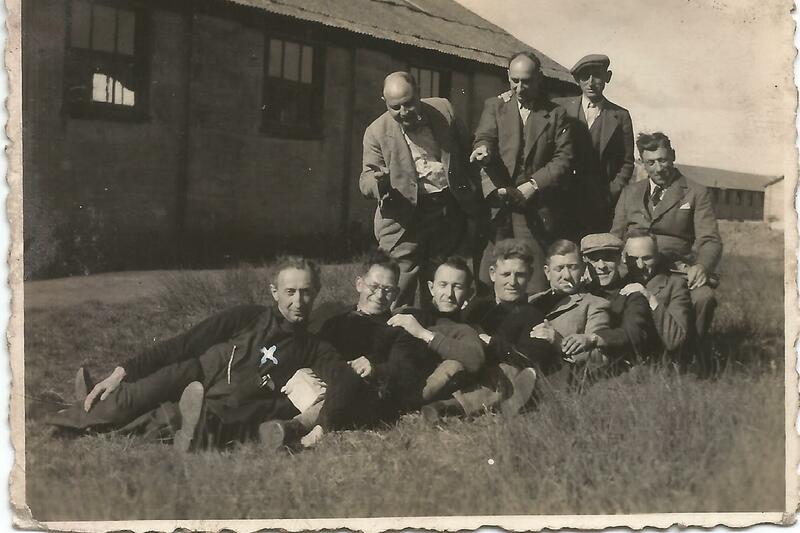 When these men left continental Europe for England in 1939, they were to travel direct to Kitchener Camp in Sandwich, Kent. Sandwich (as it is today, above) is a pretty, historic port town in the county of Kent in the southeast of England; in fact, it was one of Britain’s cinque ports. It retains many of its historic homes and buildings in the centre, and as such probably looks much today as it did when our relatives were there for a few months in 1939 to 1940. 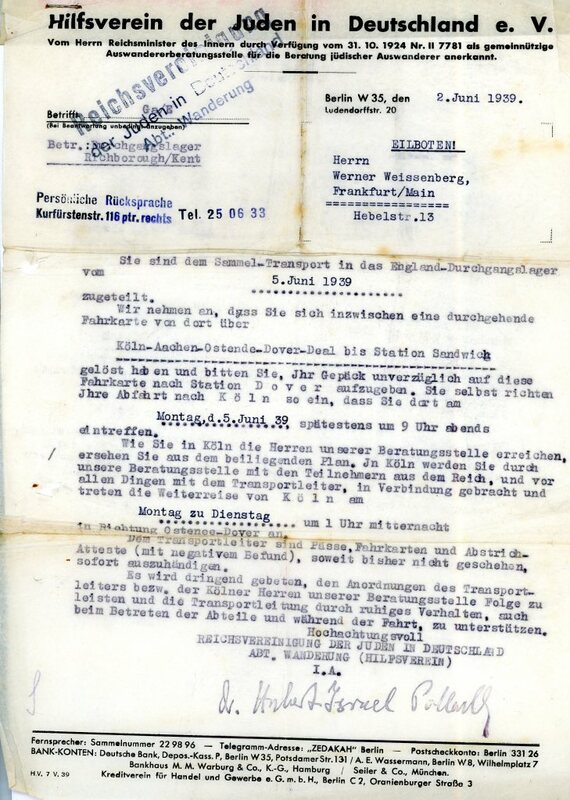 Some descendants have information in documents about routes out of the Reich territories (see here, for example). No doubt others will have similar letters, and so our knowledge of the various routes out will increase over time. Kitchener had been a World War I British Army camp originally, as the name suggests, but by this stage it had been left derelict. "We had to install doors, windows, roofs, window panes, and electric lights and do all sorts of other jobs. After these repairs, each hut was divided into two sections, and 36 fellows were accommodated in each." 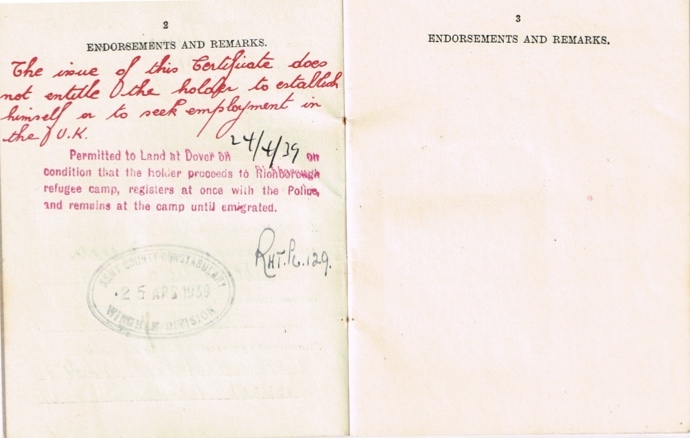 Permission was given for the old camp to be rented by the Council of German Jewry to provide a ‘transit’ camp refuge for Jewish men between the ages of 18 and 40 (see extract from the CBF minutes, above). 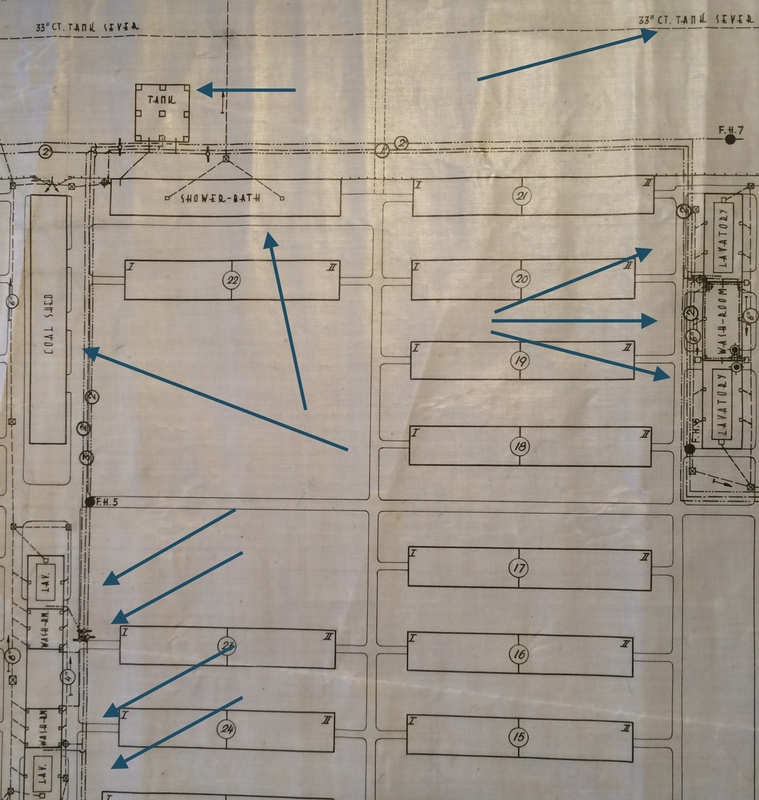 The site was large and provided a series of huts with double bunk beds for sleeping (see photographs above and Plan below), as well as buildings for catering, eating, a theatre, and so on. Some descendants know from letters and other documents which hut their fathers were in. As the family collections arrive, please scan photographs for a face you may recognise, because in this way we will gain a much clearer idea about the groups of men who shared the accommodation in this way. Hut 3 – recognise anyone? 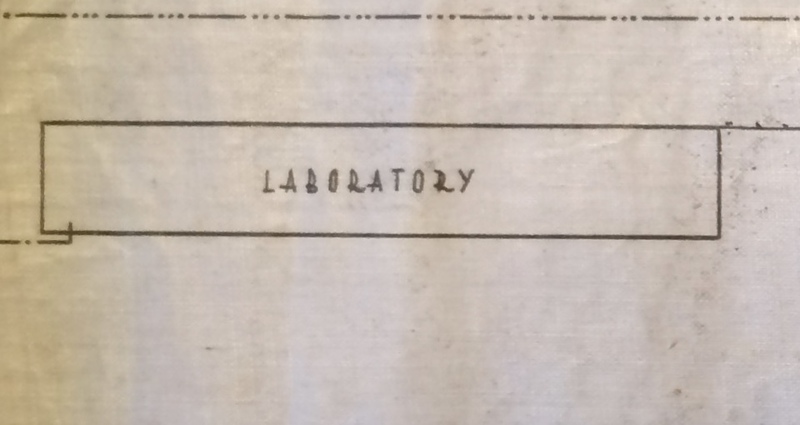 If we know Man A was in Hut 3 (see photograph right, and plan below), for example, and someone recognises their father’s face (Man B) – in a group photograph taken outside a hut with Man A – we will know that Man B was also (most likely) in Hut 3. 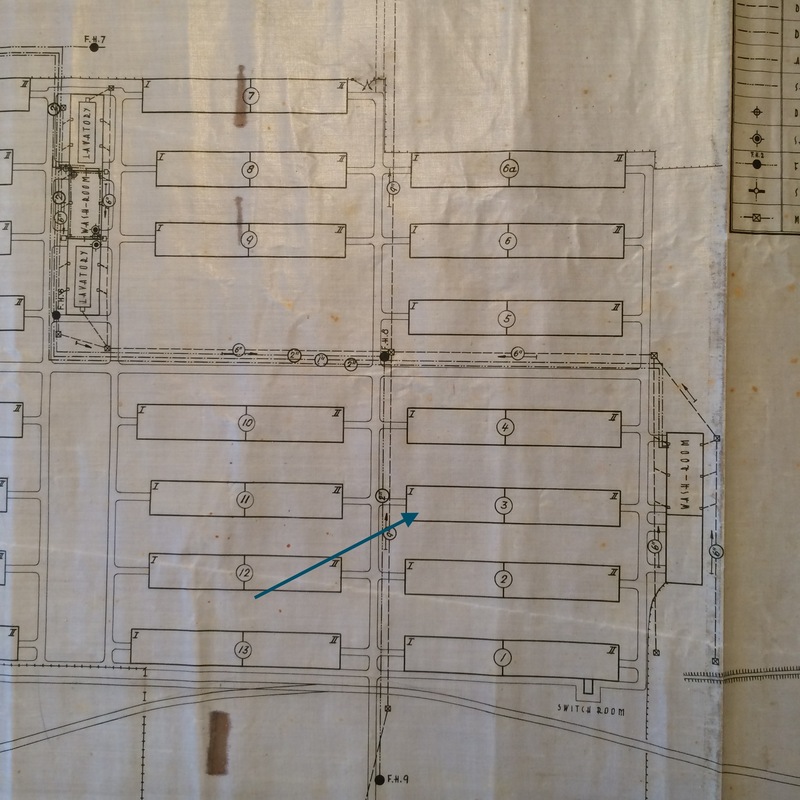 These links are important to people, and a number of descendants have already asked whether we know hut numbers, or whether particular family members managed to meet up in this vast transit camp. 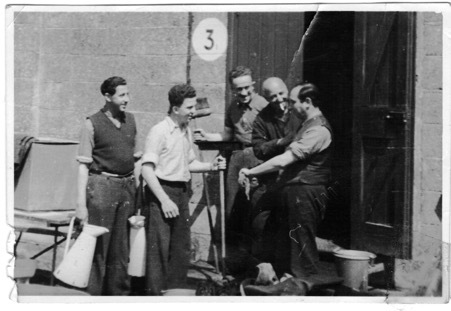 The men were allowed out of the camp with a pass, although there was a nighttime curfew. 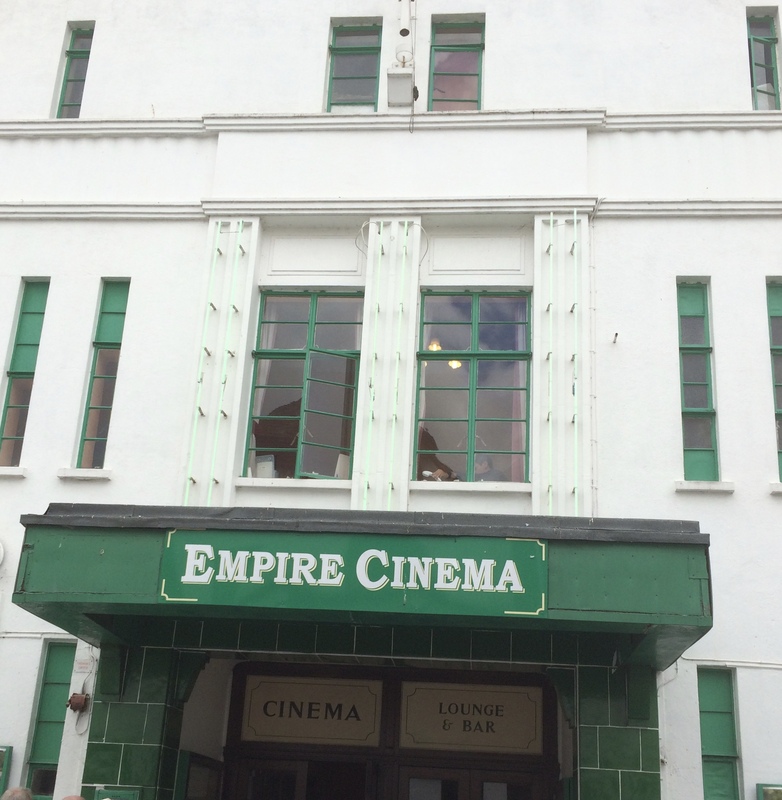 Many went to the Empire cinema (which is still going) in the town. A local store – the Golden Crust Bakery – had a few chairs and tables in the back, where they served meat pies and cups of tea. When asked for a cup of coffee by our Austrian and German family members, Mrs Kimber served ‘Camp’ coffee to start with. However, she was soon persuaded to purchase the real thing, shown how to make it, and the men then had somewhere to go for Kaffee und Kuchen, which was apparently so popular that by summer 1939 it was often standing room only at Sandwich’s Golden Crust (http://www.ajr.org.uk/index.cfm/section.journal/issue.Jan10/article=4303). Some of the men went for bike rides along coastal paths, and some went for a swim in the sea. Work was obligatory, and there was a lot to get through each day. Local farmers trained some of the men in skills for growing their own food – necessary both for their immediate situation and, again, as a useful skill for employment later. There were also roads to be built, ditches to be dug, drains to be cleared, and ongoing hut refurbishment and repairs. There was very little ‘time off’ from the schedule of work, in fact, which those men used to a professional life may have found particularly stressful. Others worked in the kitchens – preparing, cooking, and clearing up after the vast catering operations that took place three times a day. "They have a 14-year old boy. He was sent to the camp from here a short time ago, food is not to his taste. As you are cooking the rice yourself? You must appreciate the taste. Are you adding parsley? The amount must be quite plentiful." "I must outline the kitchen operation. One has to remember that 3,500 men were fed here daily, which was achieved by 400 men working in two shifts. I do not have the least intention of praising their efforts: on the contrary, this was the worst managed operation in the whole camp. An average 40 per cent of all the food was actually left uneaten, because what was prepared from the available ingredients was a disgrace." 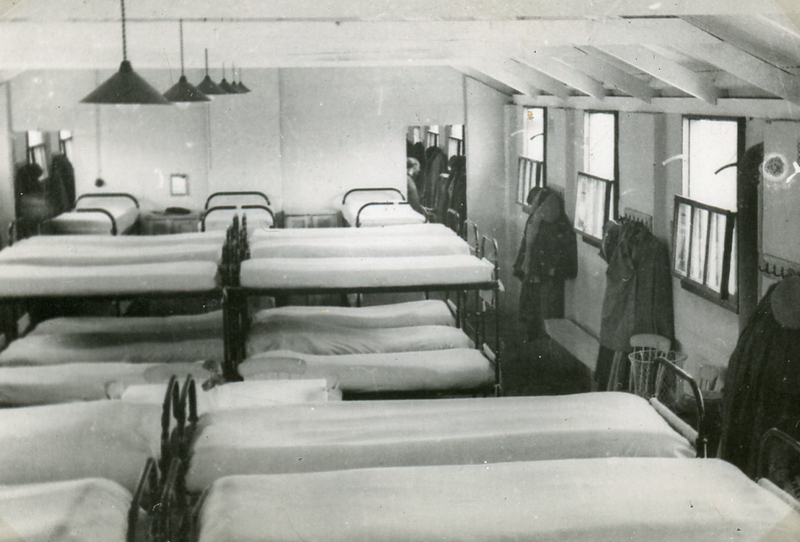 Some men worked in the offices, and a Kitchener Camp review was published for each month the camp was open. A very kind descendant has pretty much a full set of these, and we will upload the images as soon as we receive them. On Saturdays the men had some time allocated to sports (Ungerson, p. 56) – there were two football teams, for instance. And there was even a Kitchener camp song, which is quoted in Clare Ungerson’s book, Four thousand men (pp. 86/87). Presumably it was intended to be sung to the tune of the Lambeth Walk. Working the English way, Oi! Importantly, every man had to take regular English lessons, which were supplemented by helpful local people from the town of Sandwich. The chief rabbi in Kitchener, Rabbi Dr Werner van der Zyl, led readings, discussions, and services; he was assisted by Karl Rautenberg, who had also been rescued through the Kitchener transit scheme. There was a span of interest in religion, as one might expect, as well as both Orthodox and Reform Jews; Rabbi Isidor Broch was appointed for the Orthodox Jewish community. There was also a large contingent of dentists and doctors – I believe around 60 of them, but we will get this confirmed. 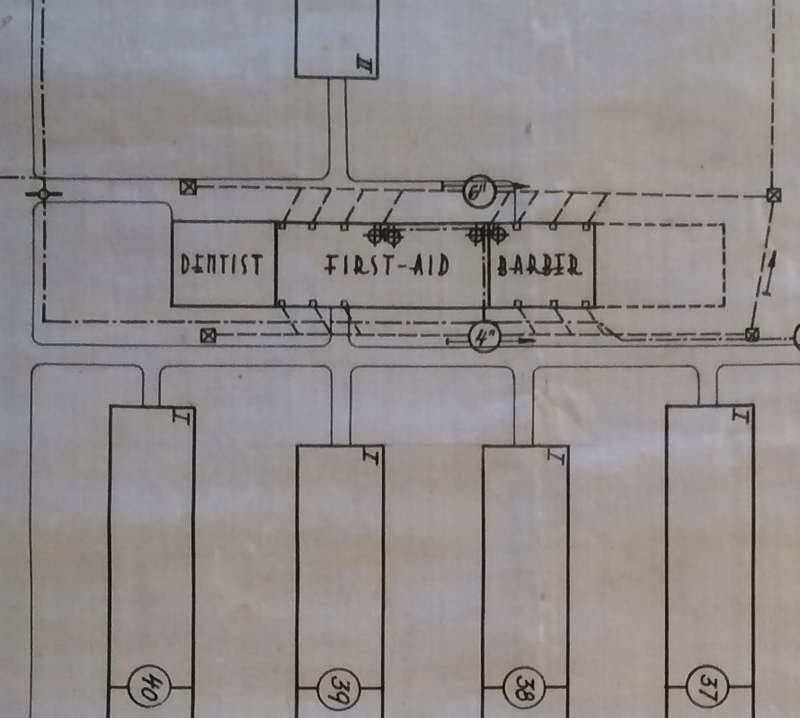 To go with these, there was an isolation hospital unit, a general hospital, a dentist, a First Aid unit, and a laboratory at Kitchener camp. As noted above, we will be hugely extending this section of the site as the information arrives here, and as we get further into the archives. For the time being, we hope this has given a snapshot of some of the issues we will be looking out for.